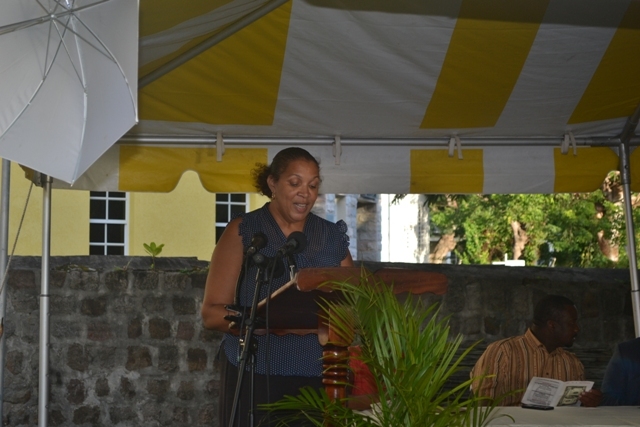 NIA CHARLESTOWN NEVIS (JANUARY 13, 2015) — Tracy Parris Coordinator of the Alexander Hamilton Fund and Community Development Officer in the Department of Community Development on Nevis, urged the four new awardees of the 2015-2016 Alexander Hamilton Scholarship to treat the funding as a privilege and responsibility. She advised the students, while delivering a report on the status of the Fund, at the annual Alexander Hamilton Scholarship Award Ceremony on January 08, 2016, at the grounds of the Alexander Hamilton Museum in Charlestown. The event was hosted by the Nevis Historical and Conservation Society in collaboration with the Community Development Department, Ministry of Social Development on Nevis. The Community Development Officer also instructed the awardees of their responsibility to maintain their academic legibility to remain in the Fund and they should be mindful of their other obligations required by the scholarship programme, among them the mandatory annual 50 hours of community service. 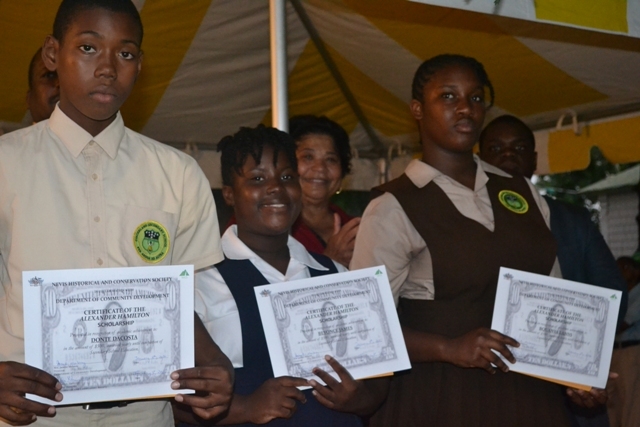 The awardees, Beyonce James and Thyreece Daniel of the Charlestown Secondary School and Donte DaCosta and Bquanya Lanns of the Gingerland Secondary School, join a list of other students who benefited from the Fund since it was established in 1966 by the Trott Family to assist secondary school students with school supplies. It is supported locally by the NHCS and members of the community and administered by the Ministry of Social Development. Also present at the award ceremony were Permanent secretary in the Ministry of Social Development Keith Glasgow who presented the awards, Director of Community Development Janette Meloney who served as chairperson, Executive Director of NHCS Evelyn Henville and Shefton Liburd who gave the invocation.